The Texas Fly Fishing School offers fly fishing and fly casting instruction in the Houston area, including individual lesson and group classes and workshops for all skill levels. We'll keep you posted on upcoming events and give you fishing reports of our outings. The importance of roll casting cannot be overstated. This is very apparent when you spend any amount of time on the Trinity River fishing for steelhead. During our trip this year, 99% of our casts were roll casts. This video clip is our guide, Aaron Grabiel demonstrating the technique used on the river. Notice that he's casting two flies, plenty of split shot and an indicator. This takes quite a bit of power during the cast to get the rig to turn over. This roll cast is usually followed by a stack mend, which helps better position the indicator to enhance the quality of the drift. Aaron's able to cast with a significant amount of accuracy as well. He's casting to the seam that's running right along the bank. This clip is about 34 MB, so it may take a while to load. What can I say? I swore that I wasn't going to get carried away with pictures of fish. There were so many nice ones, it just seemed a shame not to take another picture. There appears to be a limit to how many pictures Picasa will upload when you select the Blog This button. Later on, in the day three pictures, I'm going to make some casting commentary and post some video of Aaron doing a great roll cast - an essential tool for fishing on this river. At the boat launch, there's fog rising from the surface of the river. If you could look up at this point, there's a fog hanging over the surrounding mountains and forest. The boat setting down the river is a Fly Shop guide boat; it's rare not to see one of these guys on the river. We put our lines in the water and started fishing, quickly banging ice from our rod guides. Shortly after moving down the river, the fog lifted and it was time to re-rig, or maybe fix a tangled line. Either way, Aaron was practicing his craft. This second day was pretty slow until we hit a pod of steelhead close to the end of our float. We spent the next two hours here, pulling fish out on a pretty regular basis. Very similar to our experience last year, except we didn't get a double hookup and landing. I think our steelhead reports had 9 for me and 7 for Sandie, that doesn't count the missed fish and the one's that got away. I'll add some more pictures of my end of the catch in my next post. After a very successful and enjoyable trip last January, Sandie and I returned to fish for steelhead on the Trinity River in Northern California for the second year, this time for three days with our guide Aaron Grabiel. We learned from last year that it's absolutely necessary to be prepared for cold, wet weather. So, we brought a few extra layers along and some better gloves. Armed with an assortment of rods and lines to test we hit the river early on the Friday morning. The morning was a cool 28 degrees and overcast. No boat traffic in the river. Aaron rigged us up and the routine of cast, upstream mend, downstream mend, recast begins. Regularly, we'd respond to Aaron's "hit it, hit it". Occasionally, we'd change from the left side to the right side of the boat. The day was relatively slow. The overcast quickly became a clear sunny day, but the warm layers of clothes never changed. A few good strikes happened, one fish was achieved. I was quickly reminded that this was real steelhead fishing, a few strikes and maybe one or two fish for the day. So, by that definition, it was a successful fishing day. We were spoiled by last year's trip - about 25 fish in two days. That's now counting the missed fish. I fished an Echo 2 7wt with a Rio Steelhead line which both performed nicely. Sandie fished her Sage XP 8wt with an Airflo Sixth Sense line. We fished under an indicator using two nymph setup and used 2-4 Dinsmore AAA weights. Our roll casting skills were definitely put to the test. Aaron's ability to fix tangled rigs was tested too. A good day overall, quiet and relaxing and we got in the groove. On the second day of our three days on the Trinity River in California, as we were looking for the next hole with a pod of steelhead, we floated into a prospective spot with a young angler by the name of Tyler. 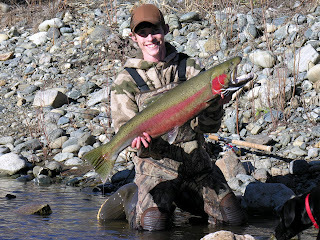 He was in the process of landing a large steelhead on spinning tackle. A big rod bend is pretty common on this river and as we drifted into the hole, no fish was visible. Moments later Tyler had the fish on the bank and he was grinning ear to ear. I offered to take a picture and post it. Well, here it is, all 33 inches, largest steelhead I've seen in this river in the two trips I've made to this river. Unfortunately for the fish, we didn't get to the hole first. This buck didn't get released back into the gene pool, but made for some excellent eating at Tyler's home that night.